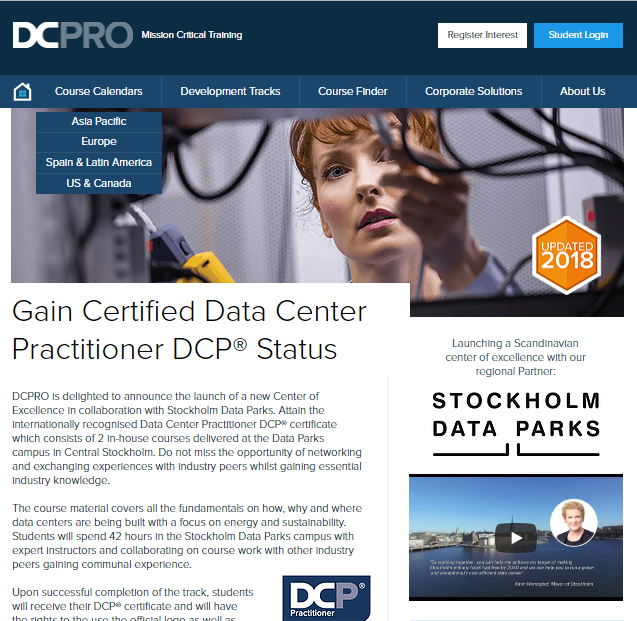 The world-leading data center training provider DCPRO and Stockholm Data Parks have agreed to work together to launch DCPRO’s new Center of Excellence in Stockholm. The Center will serve as the hub for providing training to data center practitioners throughout the Nordic region and Northern Europe. DCPRO is delighted to announce the launch of a new Center of Excellence in collaboration with Stockholm Data Parks. Working together with Stockholm Data Parks allows us to enhance our course content with the best in class insights regarding some of the key trends for data center efficiency,” says George Rockett – MD DCPRO. The first courses in Stockholm, named “Data Center Design Awareness” and “Energy Professional” will take place on October 16 and October 23, respectively. For more information about the courses, please visit https://www.dcpro.training/dcp-scandinavia. “We are excited to be working with DCPRO to establish a center of excellence for data center training in the Nordics. Students from all over the region will have access to globally recognised courses, now also including the design and practical aspects of introducing heat recovery in a data center,” says Erik Rylander, Head of Data Center Cooling and Heat recovery at Stockholm Exergi and Stockholm Data Parks.